It's Coram Week over at Indie Sew to celebrate the release of the print version of the Coram Top/Dress sewing pattern by Allie Olson. Be sure to check out Allie's tips for sewing a Coram on the Indie Sew blog! I've been wanting to make a dress inspired by the layered up tribal prints of Ace & Jig for the last little while. The simple silhouette, and collar and cuff accent pieces make the Coram Dress the perfect foil for my idea. Once the pattern was determined the fabric was the big hurtle. After a few weeks of Me Made May selfies, I've determined my handmade wardrobe is heavy on staples, but light on statements. A girl can make a statement every now and again, everything doesn't have to be denim. 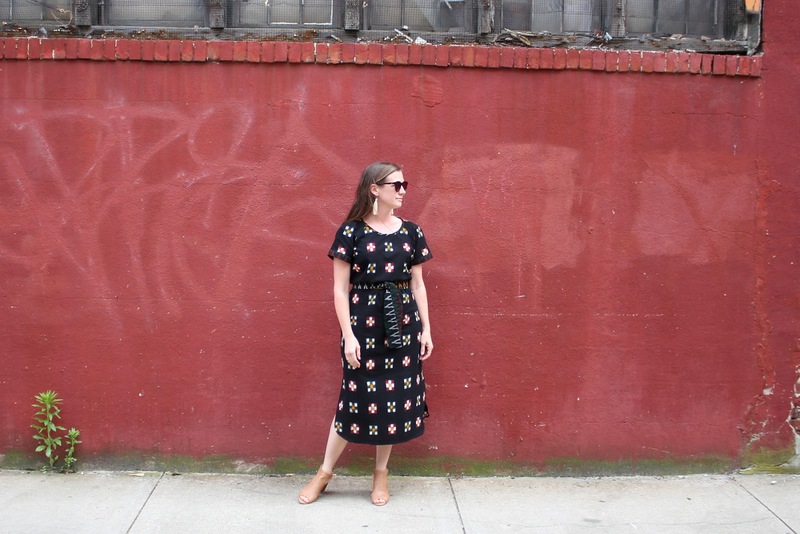 I don't wear much print, and it's tough to shop for them online where the actual scale is hard to discern. I hit on Ikat as a good fabric because of it's loose weave and sketchy patterning. Stone Mountain & Daughter has a robust selection of coordinating color ways. I'm still torn as to whether I should have gone with blue and white because it's more in my wheelhouse, but I have plenty of basics, my wardrobe could use something memorable. The Coram Top/Dress sewing pattern is a raglan style top designed for woven fabrics. I sewed an 8 bust graded to a 10 hip, with the 12 width for the skirt because it's longer than the designed dress version. I added 12" to the dress option for a midi length. The side seams are sewn to 1" below the original slit marking. I shortened the sleeves by about 1" and raised the darts a bit (common alteration for me). I drafted my own tie belt (al a Ace & Jig) that is about 2" wide, and long enough to tie in a bow wrapped once or knot wrapped twice. I used the Checker Board Ikat in Black (similar) for the body of the dress, and the Flame Stitch Black/Multi for the collar, cuffs and belt. Both are from Stone Mountain & Daughter. The fabric is a little more structured that recommended for the Coram (which likes something with a lot of drape), but I think the extra length softens the fabric a bit, and love the way it wears. This post is sponsored by Indie Sew. The opinions are my own. Kristi, this is beautiful! I love your idea to lengthen it to midi length. The ikat fabric you used are so gorgeous and perfect for this dress. Thanks Teri! The fabric is really nice to wear too! I absolutely love this! The fabric. The length. Perfect. Thanks Abbey! It's amazing how a few small changes can totally transform a design. That fabric combo is delightful! Great job.